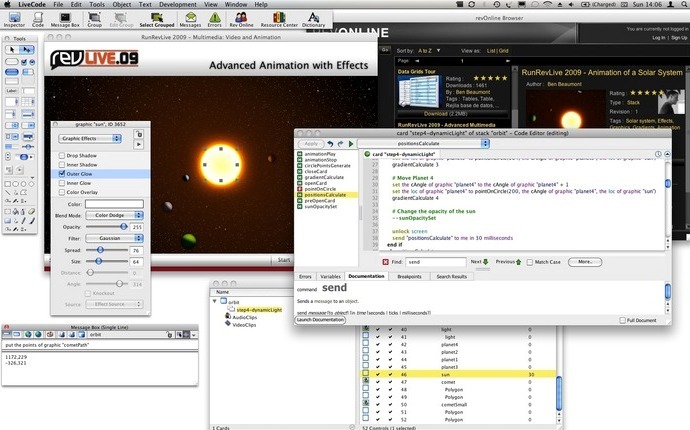 Company RunRev, fulfilled its promise and released the first of the Community-version IDE LiveCode, available as source code is licensed under the GPLv3. Code libraries used as a basis created in LiveCode application is also available under a license GPLv3, which requires developers to distribute applications created in LiveCode is licensed under the GPLv3. For users who do not want to disclose the code of their applications, and also for those who intend to place their products in the catalog Apple AppStore (this directory is not compatible with applications licensed under the GPL), extends the commercial version of IDE, which differs only licensed weakening and the functionality is completely analogous to the open Community version. Scheduled to be released in the autumn a new branch LiveCode, differing translation from monolithic to modular basis and is easily extensible architecture, and recycled frontend layer and new multimedia software interface created automatically adapt applications to different screen resolutions. I can hardly believe that hundreds of others have not already commented on this at least in other forums. Live-code has gone open source. Hypercard’s DNA lives on in this reincarnation. If the code has evolved beyond recognition, as open source, the spirit of the original HyperCard lives again!